The Health and Safety Executive (HSE) strongly advise employers to undertake regular first aid refresher training, something we support to ensure first aiders maintain their life saving skills and are updated on any changes in practice. We take pride in regularly updating our course programmes and presentations and implement and changes in first aid practice of training sooner than most organisations are able to. Having taught and been involved in the giving of first aid for many years we’ve seen at first hand, how regular updating improves skills and maintains confidence in the practical application of first aid whenever required. Our courses are delivered by knowledgeable and enthusiastic trainers all of whom hold adult teaching qualifications supported by professional qualifications. They have gained their hands-on first aid experience from a variety of different backgrounds over many years including nursing, armed forces, emergency services, hospitality, Voluntary Aid Societies, as well as other industry sectors before becoming qualified instructors. Teaching 18,000 delegates a year Acorn Health & Safety offer training to individuals, groups and entire staff teams we are committed to providing excellent training delivered in a relaxed, yet informative style. How do we approach first aid at work annual refresher training? Please bring your original First Aid at Work Certification with you to be verified. Owing to the practical nature of this course a basic level of general fitness is required. Delegates must be physically able to carry out the procedures detailed in the course outline. Should you have any questions relating to the accessibility of this course please don’t hesitate to get in touch. What should you expect from Acorn Health & Safety? We’ll provide delegates with a variety of printed course materials including workbooks and handouts. On successful completion of this course delegates will receive a printed course certificate. Post course our team of consultants and trainers are available to answer any questions you might have. You’ll also receive an automatic reminder prior to course expiry. Our First Aid at Work Annual Refresher course is just one of over 60 courses we offer. Acorn Health & Safety provides training and consultancy in first aid, fire safety, food safety, manual handling, healthcare training and health and safety. We can provide a wide variety of accredited or tailor-made courses, these can be ‘in-house’ or ‘open’ programmes. Our ‘in-house’ course programmes are the most cost effective option if you’ve a number of staff requiring training, and in many cases can be adapted to include reference to local policy, practice and documentation. These courses can be delivered either at any suitable venue or you can hire our purpose-built training centre located in Warmley, Bristol, whichever is best suited to your needs. We also run a rolling programme of ‘open courses’ which are particularly suited for individuals, organisations that only have a few delegates or those looking to release small groups of staff at a time. Please contact us to discuss all of your training needs so we can advise the most suitable and cost effective solution. Not every course can be 'off the shelf'. Our tailored health and safety training is aimed at meeting the needs of customers who have specific subjects to be covered within their health and safety staff training. Aimed at businesses and individuals requiring specific training or those with only a few members of staff to train our open courses run regularly throughout the year and cover a variety of different subjects. Prefer to talk about your training and consultancy needs? 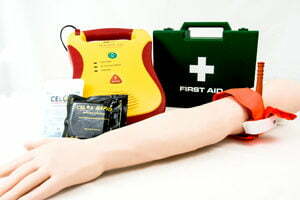 Protected: First Aid Training – Why choose us? Website by iTeam Solutions. Content copyright Acorn Health and Safety 2017 onwards.